In keeping with traditions around the New Year, I’d like to look back on the way market conditions for venture backed companies changed in 2016 and then look forward in order to make a few observations about 2017. I’ll begin by laying out a framework that puts (some of) the events of 2016 into perspective. Like many complex phenomena, the behavior of markets is path dependent. In other words, where we’re going depends not only on where we are, but also how we got here. So let’s spin the clock back twelve months to the public market correction of the first quarter of 2016. As the correction began, the private markets were riding high, “priced for perfection” as the saying goes. That public market correction was like the original impulse – the first domino to fall in an interconnected web. Somewhat paradoxically, while the public equity markets have rebounded, the ripples from last year’s correction continue their gradual spread through the world of venture capital backed companies. Late last year we presented the flow chart below to our investors at our annual meeting. 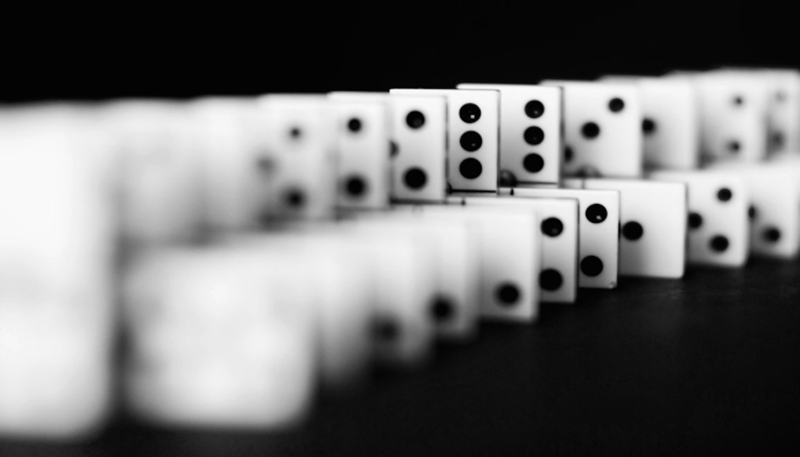 Titled “Anatomy of a Slow Motion Market Reset”, it lays out the dominoes that have fallen, those that we believe are in the process of falling, and those that we would expect to fall soon. It is intended to be reasonably self-explanatory, but there are a few points that I would like to highlight. First, despite instantaneous communications, the dominoes don’t fall all at once. Crossover players, (i.e. hedge funds and mutual funds) have to mark to market, and by the end of Q1 their portfolios were showing the correction, some in a very public way. When these crossover players started pulling back, the mid-round investors noticed and started pulling back themselves. The cascade slowly rippled down the food chain, with seed investors getting the message last, because they key off the behavior of A round investors – who key off the B’s. Who key off the C’s. Second, that IPO market shut down was a bear, with IPO volume dropping to 2009 territory (frighteningly close to zero). When the public markets recovered, the IPO domino stayed down. Volatility may have been symmetrical for public equities in 2016, but IPO volume has fallen and it can’t seem to get up. And that’s the reality confronting investors in private companies and a key reason why venture valuations and deal activity haven’t snapped back in step with the S&P 500 and the NASDAQ. Third, venture capitalists don’t just buy stock in private companies, they influence company behavior. To oversimplify, 2016 was the year when “You have to make this money last” replaced the previous mantra “There’s more where that came from.” Entrepreneurs surely noticed, and adapted their behavior to suit the new reality. Finally, as anyone who’s bought a 14-ounce pound of butter knows, there are two ways to reduce/increase prices. One is the obvious price change, which the venture world reports as pre and post money valuations. The second is more subtle, but no less relevant: if an A round investor insists on 20% more progress before it will consider investing, the price of getting an A round investment has most assuredly gone up, even if the nominal valuation hasn’t. Among the biggest changes in industry behavior/pricing in 2016 (besides the IPO shutdown) was the way the amount of capital going into the median seed round continued to climb. According to data from Pitchbook, it is now more than double where it stood two years ago. This very material change was completely predictable, but it's a big deal as it raised the effective pricing for seed investors even if nominal valuations didn’t change much. It is also a big deal for A round investors as it represents a back door price decrease for them even if nominal valuations didn’t change much. So what do we look for in 2017? The flow chart below completes the picture by filling in three more boxes that relate to the future. Changes in CEO mentality – raising private money is not as fun or inexpensive as it was.The superior price to value in private companies will attract more acquirers to the mix.Strong stock prices of public acquirers give them appreciated currency with which to make their acquisitions. As for a resurgence of the IPO market, hope springs eternal, but there is nothing in the analysis above that says the IPO window will open wide in 2017. If and when it does, there will be an extra year’s worth of inventory to be brought public, so there could be a very good year in the offing, but there is no inevitable logic driving that particular domino to stand back up. Stay tuned. It should be an interesting, and hopefully liquidity-full year. For more on what we see for the 2017 venture environment, watch our 2-minute video A Peek Through the VC Looking Glass featuring Weathergage partner, Tim Bliamptis. For a complete view of Tim’s update on the venture environment, watch Watching the Waves Unfold – An Update on the VC Environment.